Literally. Made a return to the track today after missing last week. On Monday I put up a quote about really wanting to do something and then making it happen, or making excuses. Then I went for a mid-day run (first one in six days = eternity in my running world) and it was horrible. Only made it four miles down the trail before my body said this to my brain, “No. I will not allow you to run any further. You can walk back home. Up hill.” There is little worse than being miles from home and totally defeated on a run. So, body and mind walked back together and on those four miles I decided to do the training right these last 8 and a half weeks. I’m going to embrace the runner’s lifestyle completely – from foam rolling to proper nutrition to stretching to rest days to dreadful track workouts. Along the way I’ll work out some balance issues with fun and schoolwork but I’m in a unique position of having a relatively flexible schedule, a lot of knowledgeable people around me and great support in my new running friends. I’ll admit it’s difficult to be surrounded by young, energetic, party things in this town and try to stick to a training regimen. It’s hard to fit all the fitness in between classes, work, playdates and avoiding tequila and tex mex. But no one said this was easy. I need to stop expecting it to be that way. That doesn’t mean it won’t be fun – I’m really looking forward to this race season (starting Sunday with the 10k!) – and group runs with new friends. It’s going well so far, despite face-planting on the run Tuesday…I made it to yoga yesterday to take care of those tight muscles, and have been foam rolling my legs like an pain addict. And today I made it to the track. Two sets of six 400s. The first set my goal was to push it and keep the time under a 7 minute pace each lap. The second set my goal was to try to stick to my 10k pace as practice for Sunday and I hit that pretty well too. Under 8 minute pace for each lap but not faster than 7 minutes. Woop – today felt great y’all! The temperature has dropped and the humidity has lifted and I had a good session on the track. Instead of heading for the trail this morning, I swung over to my old middle school stomping grounds to run laps. The run this morning was actually a great procrastination tool (packing up life is tough – Austin will probably keep me forever just because I don’t wanna move again. Ever.). Track run – Warm-up. 400 (1:46), 600 (2:41), 800 (3:36), 1200 (4:32), 800 (3:36), 600 (2:41), 400 (1:46) (400 RI). Cool-down. As I started into the 1200 (3 laps around), I was doing the math frantically in my head. How can I add an entire lap and have a goal time increase of just over a minute?! There’s no way I can do one lap in less than a minute! Did I do my math right? If I ran an additional lap at 5k pace that’d be a 6:10 mile! I’m not trying to be Olympic fast…..! These people are crazy…..
And then my 1200 was over – and I did it in 4:56, :26 seconds slower than goal pace. When I finish big workouts like that one, I’m not usually hungry right away for solid food, especially hot solid food. So instead I grabbed a chocolate milk mini-jug and typed this up. 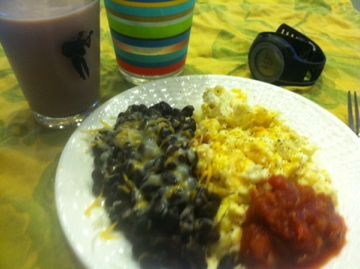 But I will be having a TexMex inspired breakfast in honor of Austin. This was one of the fastest and easiest breakfasts I’ve made. I just scrambled two eggs with a tiny bit of cheddar cheese and then in the very same skillet (after the eggs were finished), I cooked a cup of black beans (canned). You only need to cook ’em for about 2-3 minutes to get them hot. I dumped ’em on the plate next to my eggs and topped both with salsa. That’s it – so delicious! YUM! If you need me today, you know where to find me – buried under furniture, clothes books – oh, and my millions of $$$ from the garage sale. Back in Memphis someone nicknamed Tuesday night track workouts – T.N.T. or Tuesday Night Torture Track. I went several times towards then end of my stay there and while they were tough, the group dynamic forced me to push myself and I know I was getting faster (that is until I stopped going in favor of another version of T.N.T. – Tuesday Night Tequila – hey, I was celebrating my way out of Memphis). Well today I re-introduced myself to the track workout with some modifications. I did it in the morning. I put evening runs right up there with dentist appointments on my least favorite things list. I did it alone. No one on the B-team has speedwork in their vocabulary so I broke of from the group for this workout. It was a blessing and a curse – I didn’t have the group pressure to push myself. And I didn’t have the group pressure to push myself. I did it on the trail. 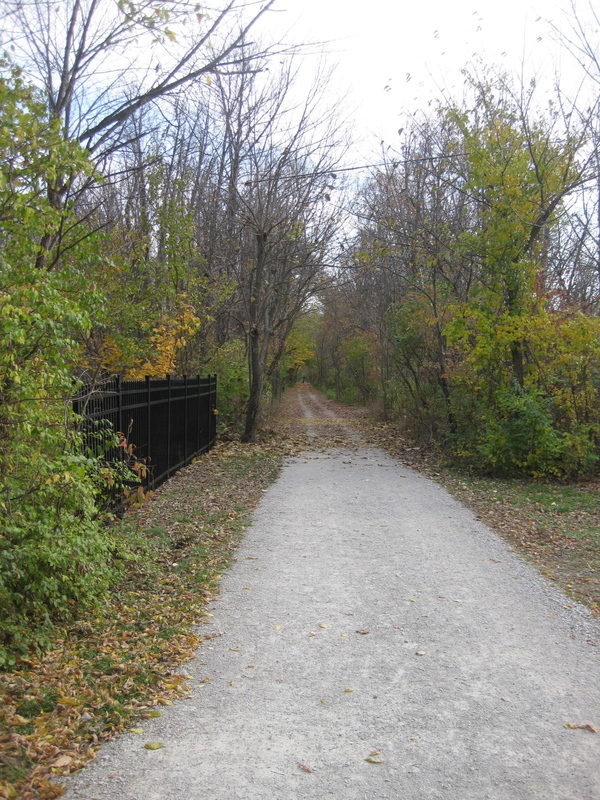 There’s a great, flat, shaded, softer-than-pavement section of the Zionsville Rail Trail and that’s where I headed for the repeats. I put the 400 repeats in bold in Gary’s report above. I started off pretty strong but can tell that I fatigue by halfway. It became increasingly harder to maintain the 1:40 goal and even tough to hit the 1:50. My biggest accomplishment was completing all 12. There were many times I considered shortening it – especially as the dark clouds rolled in. I had two repeats to go when the wind picked up and leaves started falling off the trees, across the path. Since it’s been so dry there were actually quite a bit (can I blame slower times on wind resistance?!) I even got rained on for the cool down but it felt incredible. Not too hard and just enough to cool myself off. Well, only 17 more track workouts to go – eye on the prize!